I think— Polish, Doctor the Bichon, Montana street, chocolate, joy, growling, learning love, Chicago streets, alleys, imagination filled spaces, summer bike rides. Roots are potential energy—are a representation of where you have been energetically. I think of co-planting, of nitrogen fixers, of the micro-biome of harmonious bacteria surrounding the roots of everything we ingest. Thinly veiled meditation on humanity and our expanding emotional experience reaching for satiation. I think about my personal alchemy—the processing of experience into who I am and what memories and choices for gratitude I carry with me. I think of the sensations and the love I push down into my roots—waiting like an energetic water table—slowly released back into the world. I think of co-planting this silent conversation of biology and the chemistry between ourselves and the people we open our lives to. Co-planting, I think, is the ultimate feeling of being rooted; the kind of sitting next to someone that feels like bedrock and dew at the same time. I think of rooting in a feeling of calm—eyes closed, mentally open, the orchestra of the heart. There is a difference between rooted and keeping your head out of the clouds. Both the roots of the sesame seedling in my living room and the roots of my curiosity and my propensity to joy are governed by gravity. A third of a century into the root of ego, of being born in my life course, is like dew that has just formed on slate in the morning of spring overflowing with moisture. My life goes where it may—drawn to the best approach of falling to earth—constantly swimming back to my roots. Roots—learning to love, experiencing kissing as acknowledgement, kissing as making love. Ola Klimczak will love to share tales of dreams from the night before and what the sunset today or the plumes of flower molecules you smelled made you feel. 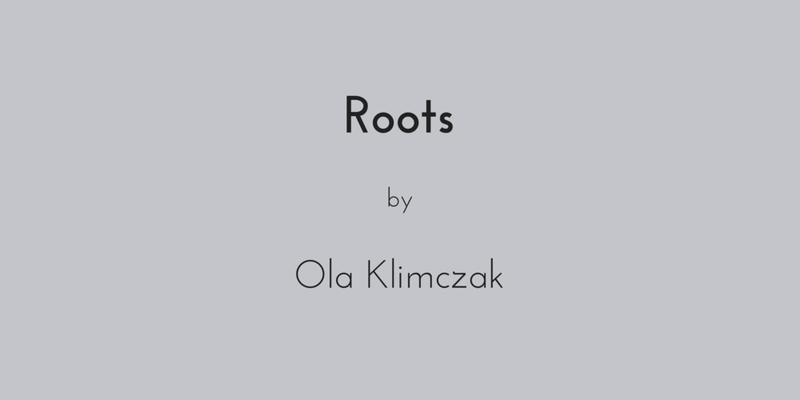 Ola Klimczak is a Photographer, poet, retail intellectual, journalist in it for the best conversations and the wonderful questions that follow, a brainstormer, dancer, hiker, lover, poly, queer. Ola strives to grow, learn, and ask perpetually. Ola has an endless passion for forward hoping/thinking/creative curiosity. They dreams of a post collegiate economy that networks brilliant minds to brainstorm the problems, need for resources that we all face. Ola daydreams of starting a self relatively sustainable piece of land to build a community of artists, athletes, performers, healers, scientists, farmers, carpenters, and makers. Poems with geology, neurology, and physiology soaked imagery will be written there. Born in Cook County Hospital, Ola is a grateful Chicagoan. Chicago introduced Ola to food magic, to gifts, to medicine, and to craving.